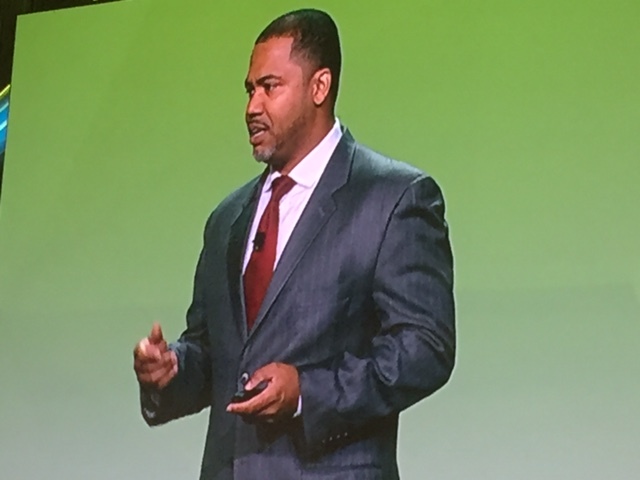 Participants were moved to tears (and laughter) by keynote speaker Manny Scott, roused by keynote speaker Yong Zhao, inspired by Keith Jones, and gained insight from keynote speaker Steve Ventura. They also honored state award winners, thanked outgoing presidents and welcomed new association leaders. COSA President Cindy Quintanilla presented awards to state winners, from left below: OASE Superintendent of the Year Heidi Sipe; OASSA High School Principal of the Year Margaret Calvert; OASSA Assistant Principal of the Year Drake Shelton; OESPA Elementary Principal of the Year Heather Yount (with sponsor Learning.com); OASSA Middle School Principal of the Year Steve Bell; OACOA Achievement of Excellence Honoree Kyra Donovan; Small Schools Association Administrator of the Year Kristi Woika (with Michael Carter); Bev Gladder Mentorship Honoree Sheila Roley; OASE Excellence in Curriculum Achievement winner Beaverton School District, represented by Susan Holvek; and President's Award Honoree Deno Edwards. Presidents for next year were sworn in on the final dat of the conference. Below left, COSA Past-President Colt Gill swears in 2016-17 COSA President Matt Thatcher. Below right, Gill welcomes 2016-17 officers (from left) OASSA President Lee Loving, Thatcher, OACOA President James Hiu, OASE President Jim Golden and OESPA President Ginger Redlinger.